Apexi World Sport 2 Exhaust Nissan 350Z. Dual Left and Right mufflers. 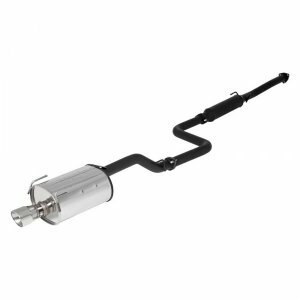 All WS II exhaust systems comply to emission laws because they do not modify or relocate the catalytic converter and factory O2 sensors. Since the legality of exhaust products is based on them being considered "direct replacement" parts there is no certificate necessary to issue for this series. For "add on" or "modified" parts which require an Executive Order (EO) number there is a mandate for an under hood label which must be included with the product. The WS Series is "functionally identical" to the OEM part it replaces during the condition under which emission testing is conducted. Sound levels of the WS series also average in the mid to high 80dB range.